You are here: Home / Rider News EU / Doomed or Marooned? On Tuesday 30th August 2011 the Internal Market and Consumer Protection (IMCO) committee met for a second debate on the proposed regulation and the hundreds of amendments, 304 at the last count, regarding the approval and market surveillance of mopeds, motorcycles, trikes and quads. What did we learn from this session in the European Parliament? We learnt that the Rapporteur in charge of the IMCO committee report, Dutch MEP, Wim van de Camp had an recent accident on his motorcycle. He said “It’s a bit embarrassing your (referring to Malcolm Harbour, UK MEP and Chairman of IMCO) introduction to me because – If my motorcycle had ABS braking I wouldn’t have found myself on the ground last week and I would be in finer fettle. Let’s say I have some problems with my legs but I didn’t hit my head”. So he’s no longer the motorcyclist’s friend? 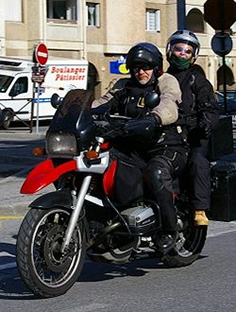 He is now getting down to his job rather than use his hobby of motorcycling as the basis for his “expertise” as the rapporteur for the IMCO to challenge the Commission’s proposals for the EU Regulation on the approval and market surveillance of two- or three-wheel vehicles and quadricycles. In terms of using his position as a parliamentarian to ensure that the Commission does not “overstep its mark” he has done a superb job in his presentation of the IMCO’s draft report on the subject. Bear in mind that the proposed regulations that he overwhelming supports with a few minor amendments will increase the cost of motorcycles in Europe and will drive motorcyclists towards buying second hand vehicles and keeping them for a longer period of time, thus defeating the purpose of the legislation they (Commission and Mr van de Camp) want to introduce. Mr van de Camp concluded that he would need time to consider the various (political) positions to arrive at a compromise. However he pointed out the responsibility of the committee is to focus on technical issues. He indicated that with regards to emissions, the Greens want to go more quickly, while he wants to go more slowly. He said that they are are now trying to come to an agreement and have the commission’s text to consider. He pointed out that there were huge gaps between the various positions of the shadow rapporteurs. Well, apart from the fact that it has become apparent that the various political factions are posturing and politicking, not much has happened since we wrote our previous article which considered the IMCO committee’s 298 amendments – except that there are now six more amendments. The Chairman of the IMCO committee wound up the meeting with the comment “We have work to do”..
We learnt that the next meeting of the shadow rapporteurs and the rapporteur to discuss the report will be held in Strasbourg between the 12th and 15th September and the IMCO vote will be on October 6th. These MEPs have proposed amendments that are in some cases worse for motorcyclists and some are supportive of motorcycling, but in the end these proposals and counter amendments will all end in a compromise that will make “peace in our time” look like a discussion about who should buy dinner. All this depends ultimately on who has the biggest “political” support and not necessarily what will be beneficial for the future of motorcycling. We will have to wait to October to find out the result of the “compromises”. Well, in the UK, riders are being coordinated by the Motorcycle Action Group UK to protest against these proposals by organising a national demonstration on September 25th, up and down the motorways and major roads of the UK.The demonstration also supports the issues that the French and Irish have regarding Hi Viz clothing and the ban of vehicles over 7 years in French cities. Riders in Ireland are also protesting on the same day, this appears to be organised mainly through motorcycle forums in Ireland, with support from MAG Ireland. 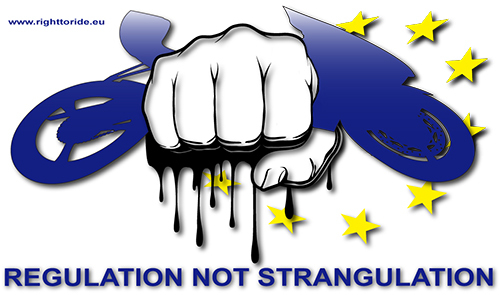 But – we ask – apart from the UK and Ireland, what are the rest of European Riders organisations doing?Are they protesting against these EU proposals?Are they lobbying their governments or MEPs? Are we doomed or just marooned? Fly in the Ointment – or The Best of British? During the IMCO meeting several references where made about the UK Government, our ears pricked up at this and we went looking to see what the UK Government had said.What we found was a report from the Parliamentary European Scrutiny Committee which assesses the legal and/or political importance of each EU document (about 1,100 per year) and decides which are debated. On the 19 July 2011 the committee debated the EU Draft Regulation. The UK government has raised concerns on the European Commission’s draft regulation and the IMCOs draft report. However at least we have a position and thoughts from the UK Government and the proposal is being looked at and is on the radar!